The medical assisting field in Pennsylvania is poised to grow over 17% through the next decade according to the Bureau of Labor Statistics. That translates to just under 4,000 new jobs. The forces driving this trend are an aging population and the increased availability of health care as a result of the Affordable Care Act. Pennsylvania schools offer programs in medical assisting at the certificate, diploma and associate degree level. Programs can be found at the state's community, private and technical colleges. And, while Pennsylvania law does not mandate specific training for medical assistants, many employers prefer to hire Certified Medical Assistants (CMAs)-a designation that can only be obtained by graduates of accredited programs who pass a national credentialing exam. Read on to find out more about certifications, schools, and salary information for medical assistants in Pennsylvania. The need for trained medical assistants has rapidly increased in recent years, making a degree earned in medical assisting a valuable asset for students looking to begin a career in the medical field. We’ve looked into some of the best online programs in Pennsylvania, basing our findings on an institution’s class sizes, student-teacher ratio, and overall graduation rate. 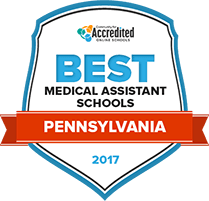 Look below to find the best medical assisting programs in Pennsylvania for 2017. The medical assisting program at HACC prepares students for entry-level positions in a variety of ambulatory environments. They will learn how to perform administrative duties as well as to work directly with patients and other caregivers. There is a certificate and an associate degree option, both of which qualify students for the same work at similar pay. If students complete the certificate program, they may then pursue the college's health science associate degree, provided they achieve the CMA credential first. Students who earn a supplementary degree in administration or management could pursue careers as office managers. The program is accredited by the Commission on Accreditation of Allied Health Education Programs. The three-semester medical assisting certificate program at Bucks County Community College culminates in a full externship, which constitutes the entire final semester. The program focuses on career preparation, and although transfer to a four-year school is possible, students planning to continue their education should work closely with an advisor to ensure a successful transition. The program concentrates on the clinical and administrative aspects of the profession, and graduates will leave prepared to perform a wide range of functions, including administering immunizations, drawing blood, collecting lab specimens and performing front-office duties like managing accounts receivable and payable. Students at the Pennsylvania Institute of Technology can earn an allied health-clinical medical assistant degree in 18 months. The program provides general education not only in health, but in math, science, humanities and English. Once they achieve the associate of science degree, students will be prepared to begin developing a specialization within the field. The program also provides sufficient coursework for continuation onto a full bachelor's degree at a four-year school. The non-profit school offers students access to academic advising, job-placement services, transfer services and a wide range of other academic support programs. The medical assistant program at the Community College of Allegheny County results in an associate of science degree. Upon completion, graduates will be ready to enter the field at the entry level. They will be qualified to assist with procedures, complete insurance forms, maintain medical records and perform routine laboratory procedures. The program is accredited by the Commission on Accreditation of Allied Health Education Programs. Student services include career and development planning, tutoring and academic help, technology support and counseling services. Students who need them will also have access to supportive disability services. Graduates of the Harcum College medical assistant associate degree program will be prepared to support doctors and other wellness professionals by performing a range of clinical and administrative duties. The Office of Career and Transfer Services works to prepare students for their job search or further education after their time at Harcum, and the Dress for Success program offers students of both genders and varied body types the opportunity to borrow business attire for interviews and other professional encounters. The library offers students access to research materials, ebooks, print journals, archives and media services. Students will also receive academic advising and counseling services, if required. Before enrolling in the medical assistant associate of applied science degree at Lehigh Carbon Community College, students are urged to first meet with an academic advisor dedicated specifically to that program. Students will receive complete medical secretarial training, as well as laboratory and clinical education. The program, which is accredited by the Commission on Accreditation of Allied Health Education Programs, prepares students to sit for the American Association of Medical Assistants (AAMA) certification examination once they graduate. For the last several years, the overwhelming majority of program graduates passed the exam and found employment within six months. The medical assistant program at Delaware County Community College, which is accredited by the Commission on Accreditation of Allied Health Education under recommendation of the Medical Assisting Education Review Board, offers both a certificate and an associate degree track. New students will have access to assessment services and help with college planning. Some will be eligible to receive credit for prior learning. Incoming students will benefit from an orientation, and a program called First-Year Experience offers outreach activities and other services and programs for those new to college life. The college also offers veterans services, disability services and counseling. Once they earn an associate of applied science degree from Pennsylvania Highlands Community College, graduates of the medical assisting technology program will be prepared to work in medical offices or similar settings. Other career opportunities include health claims analyst, insurance claims reviewer, billing coordinator and medical office manager. During their time at PHCC, students will have the opportunity to join a wide range of organizations and activities, and they will be kept in the loop through PEAK, the school's text message notification system. Students will have access to advising and career services, as well as the Student Success Center. When you are looking for a program in medical assisting, there are several factors you should take into consideration. Will I come out with an associate degree or a certificate? Does the program offer training in skills I am interested in learning such as psychology or pharmacology? Does the program include a supervised practicum or externship? It is also important to understand whether or not you will be eligible to become a Certified Medical Assistant (CMA) after you complete your program. Use this search tool to check out medical assisting programs in Pennsylvania. How is medical assisting defined in Pennsylvania? In Pennsylvania, medical assistants are unlicensed personnel working in a health care setting. Pennsylvania does treat certified medical assistants (CMA) and registered medical assistants (RMA) differently than uncertified medical assistants. The essential difference comes down to what tasks and duties practitioners are able to delegate to medical assistants. For example, only "credentialed medical assistants", meaning CMAs or RMAs, can enter a medical order into the electronic medical records for meaningful use. Certification is not required for medical assistants in Pennsylvania. However, the Pennsylvania medical code states that in order for physicians to delegate clinical and administrative tasks, they must have "knowledge that the delegatee has education, training, experience and continued competency to safely perform the medical service being delegated." One way to ensure and, for legal purposes, be able to prove a medical assistant can be given specific tasks in through nationally recognized certification. What MA certification is available? The most commonly recognized and accepted certification is the CMA. CMA candidates must be recent graduates of medical assisting programs accredited by the Commission on Accreditation of Allied Health Education Programs (CAAHEP) or Accrediting Bureau of Health Education Schools (ABHES). And, they must pass a national credentialing exam administered by the American Association of Medical Assistants. Below is a list of nationally recognized credentials. It is not required, but often preferred. And, again, in order to become a CMA, you must be a graduate of an accredited program. Many employers in Pennsylvania will require a background check, immunizations and a physical including a drug screening. What tasks are within the scope of medical assistants in Pennsylvania? The table below compares annual and hourly wages for medical assistants in Pennsylvania with the nation as a whole. Salaries in Pennsylvania can vary as much as $2 per hour across the state. In general, nonmetropolitan areas have lower hourly wages than cities and metropolitan centers such as Lebanon or Philadelphia. However, wages in the cities of Altoona and Erie are actually lower than those found in Eastern nonmetropolitan areas. The medical assistant field is in Pennsylvania poised for considerable growth through the next decade-nearly 4,000 jobs will be added. Your medical assistant education can really set the tone for the success of your career. By attending a program accredited by the Commission on Accreditation of Allied Health Education Programs, you are eligible to sit for the Certified Medical Assistant (CMA) exam, a credential that is often required by Pennsylvania employers. Here are a few accredited schools to help kick off your search for the right school. The AAMA provides continuing education, advocacy, and credentialing for medical assistants-specifically the certified medical assistant (CMA) exam. This organization is an education, advocacy, and professional organization for physicians and their site contains useful information on the scope of practice for medical assistants in Pennsylvania. This is the state chapter for the American Association of Medical Assistants and has local chapters in Allegheny, Beaver, Blair, Butler, Cambria, Erie, Lancaster, Lehigh, and York Counties, as well as the Tri-County area.